You are here: Home / Apple / How to Netboot install ESXi onto Apple Mac Hardware? It was only earlier this week in preparing for a customer call next week that I decided to re-open an email thread that I had with our Engineering folks which dates back almost 3 years ago. Although nothing had changed from the VMware side, this then lead me to check whether something had changed in the IT community via a Google search. To my surprise, I came across the following article where the author claimed they were successful in Netbooting a Mac system using Linux. The biggest breakthrough for me in that article which also built upon the work from another individual here (sadly the link recently died) was the fact that they were able to get BSDP working with a standard ISC DHCP server. This was the first challenge in just getting a basic response from a Mac system, which the solution indeed provided. My first attempt of booting ESXi onto my Mac Mini used the traditional PXE/TFTP combo and it was partially successful. It was a success in the fact that the ESXi bootloader (bootx64.efi) was actually loading, but it would consistently fail at downloading the 11th file with a Fatal 33 (Inconsistent Error). I had tried various TFTP boot options including the per_source option which supposedly lifted the default 11 file limitation, but there no change in behavior. The theory that I concluded with was that the TFTP client on the Mac system might have just been limited as I was able to successfully download the file from a Linux-based TFTP client. However, this basic test in itself was also a break through as it proved for the first time, that it might actually be possible to Netboot ESXi onto Mac hardware. While sharing the updated news with a few of our Engineers, Tim Mann, one of our Sr. Staff Engineers at VMware provided a great pointer to the next step that I could try. Given the fact that we were able to serve the initial files via TFTP, what we could try is to boot up iPXE and then chain load that to the ESXi bootloader. A very useful resource for general PXE/UEFI installation of ESX is this whitepaper here which is also authored by Tim. This is definitely worth having around when working with scripted installs of ESXi. With a few additional tweaks to the DHCP configuration file, I was able to fully boot the ESXi installer over the network to my Mac Mini! I was literally jumping up and down in front of my wife when this happened 😀 I believe this might actually be the first time this has ever been done before! Very cool if you ask me. I have verified that this solution works for ESXi 6.5 and ESXi 6.0 out of the box. This solution also does work for ESXi 5.5, but you will need to use a newer ESXi bootloader (bootx64.efi) from ESXi 6.0 or newer as it contains some additional fixes. I have also verified that this works with scripted installs (Kickstart) as you would expect. I think and hopefully you will agree with me that this is HUGE news for the Apple/VMware community. Historically, it has been very challenging to manage Apple Hardware as installations of ESXi were mostly done manually or at least requiring someone to physically plug in the media to the system. Not only will this benefit customers of all sizes whether you manage several dozen Mac machines to several hundred which we have quite a few customers doing, but it will actually enable customers to scale even higher and faster now. No longer is this an operational burden which is something that I hear quite frequently from customers in terms of ESXi lifecycle. OK, so now that you have some background on how we arrived at the solution, below are the steps to set this up in your own environment. Apple Mac Hardware to test with. Although it didn't make difference, its worth checking that you are running latest EFI firmware on your Mac hardware. Note: The initial reference article included several Docker Containers which I had started with to perform the initial test, but due to issues with journald not working within a Docker Container which made troubleshooting nearly impossible. I opted to just build this myself as it was pretty simple and allowed for easier debugging. I may consider building a specific Docker Container targeting the ESXi use case that folks can pull down and just use. 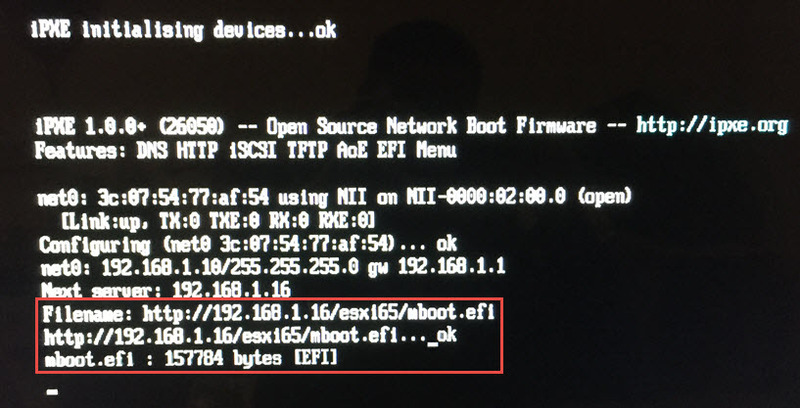 This will allow us to serve the ESXi bootloader from our webserver using http://[IP-OF-WEBSERVER]/esxi65/mboot.efi which will in turn load the ESXi installation files. Step 5 - When the ESXi bootloader runs, it will be looking for the boot.cfg in one of two locations. The first is in the root of your webserver /boot.cfg and the other is /[MAC-ADDRESS-OF-CLIENT/boot.cfg. The latter option allows you to control which version of ESXi is served to a particular Mac system. Assuming you would like that level of control, you will need to get the MAC Address of your Mac system prior to performing this step. Step 8 - If you have successfully built iPXE, the following file should exists bin-x86_64-efi/snponly.efi and you will need to copy that over to your TFTP directory which by default is /var/lib/tftpboot, unless you have changed it. Step 10 - Copy the working sample-dhcpd.conf to DHCP configuration directory. You will still need to edit the file to adjust the networking to fit your environment starting with Line 1-2, 64-69. Line 106, 115 & 118 will also need to be updated to reflect the IP Address of your Ubuntu system. In the sample dhcpd.conf, the netboot class is what serves the initial iPXE image and then afterwards, the pxeclients class is what loads the ESXi bootloader. Step 11 - Finally, the last step is to start both the DHCP and TFTP services by running the following commands. It is recommended that you run the status command to ensure there are no errors in your DHCP configuration file before proceeding to the TFTP service. At this point, you are now ready to boot your Mac system! You will need a keyboard connected to your Mac as you will need to hold down the "n" character to perform a Netboot (not sure if this is the default behavior or a way to configure it to do this on-boot?). You should see a globe icon for a few seconds and then see iPXE getting booted if everything was configured correctly. 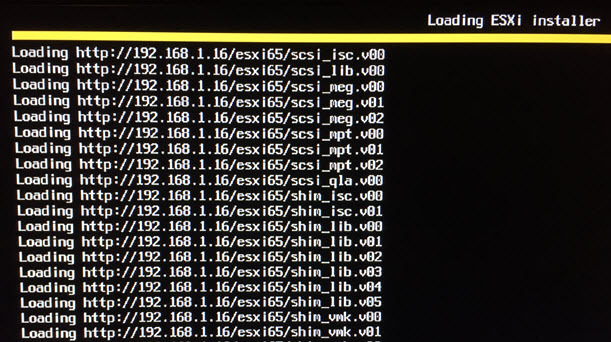 This process will be quite fast, but if you look carefully, you should see iPXE now chain loading the ESXi bootloader as you can see from this semi-blurry screenshot (took me several attempts to capture this). Once the ESXi bootloader is loaded, it will then look for the boot.cfg file that we had configured in Step 8. Once it successfully locates this file, it will know where to download the ESXi installation files which will now happen over HTTP, rather than the traditional TFTP. This part of the boot was blazingly fast compared to a traditional PXE installation where the files were being downloaded and serve via TFTP. This definitely will speed up deployments and something to consider in general whether you are doing Netboot or PXE Boot of ESXi. I never thought I would be so happy to see our ESXi installation screen on the Mac 😀 There you have it, a successful Netboot of ESXi onto Apple Mac Hardware! The icing on the cake for me is that you do not need to have Mac OS X system to run the Netboot Server. This means for customers who are already doing PXE Installation of ESXi and other *nix OSes, they should be able to easily incorporate this into their existing infrastructure. 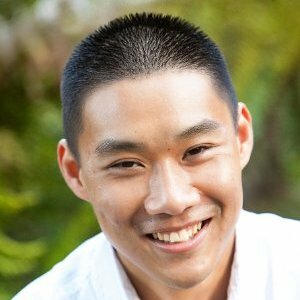 One other thing I would like to try once I get some additional time is to see if this also works with vSphere Auto Deploy, which would also open another door for customers looking to leverage Auto Deploy and Host Profiles to easily manage and lifecycle their ESXi hosts running on both Apple and non-Apple hardware. I also have a very basic Kickstart script included in the Github repo that you had downloaded in Step 9 under netboot-esxi/sample-ks.cfg that you can use as a test. If you wish to use vSphere Auto Deploy with Apple Mac Hardware, have a look at this article for more information. There was quite a bit of trial/error during my experiments and so the following were useful for troubleshooting. Here is the path to the webserver logs, this can be useful to quickly identify the MAC Address of the Mac system you are booting from as well as seeing what HTTP request are made when to retrieve the ESXi bootloader or installation files. For general DHCP and TFTP debugging, you can tail the system logs. During the validation of serving up iPXE via TFTP and trying to chain load to the ESXi bootloader, I found that the iPXE shell was not working (e.g. CTRL+B). This would actually allow me to confirm that I could in fact chain load the ESXi bootloader before spending more time in the DHCP configuration file. Due to it not working on the Mac hardware, I needed to compile an additional iPXE binary to include an iPXE script which would then retrieve DHCP address and then automatically start the iPXE shell. This is really useful to see if there are any connectivity issues (especially pesky firewalls or selinux) that might be blocking the connection. I have compiled some detailed notes about how Apple’s NetBoot system works, especially the Option 43 data. With that in mind, it should be possible to do pure Apple NetBoot without iPXE, especially because your files are coming down via HTTP. Apple NetBoot uses TFTP for acquiring a booter (efi file) and a pre-linked kernel (kernelcache). Previous iterations downloaded the kernel and a kextcache separately. The limitation, as you discovered, is that Apple’s EFI only downloads files < 32MB via TFTP. This is a known limitation of the Apple EFI firmware, and occasionally it is painful (for example when Apple's own System Image Utility generated kernel caches greater than 32MB in some of the 10.9.x releases). But I would be interested in seeing if you could make this work without iPXE. Glad you enjoyed the article and thanks for the ifo. In terms of doing this purely w/TFTP (e.g. no iPXE), I wasn’t able to get this to work either. I did try the combination where boot.cfg was also placed in TFTP root directory but rather than serving it over TFTP, I tried adding prefix to webserver, but our bootloader failed to find the files. I suspect it must be served using same protocol the ESXi bootloader was booted up with. Do you know the total size of the files being downloaded via TFTP? I wonder if Apple also has a maximum amount of RAM to dedicated to TFTP download. I do know that no single file can exceed 32MB. Gerrit, where does HTTP come into pure Apple NetBoot? You wrote “it should be possible to do pure Apple NetBoot without iPXE, especially because your files are coming down via HTTP”. We used iPXE in this solution partly because we ran into the 32MB limitation in Apple’s EFI TFTP implementation, and partly to get HTTP capability. Does Apple’s “booter” or “cached kernel” contain an HTTP implementation? If not, what did you mean by “especially … via HTTP”? Interesting read and something I am going to try. \You may be interested in BSDPy which is a BSPD server written in Python to allow Netboot from non-macOS servers. The code is here https://github.com/bruienne/bsdpy and a Docker container here https://hub.docker.com/r/bruienne/bsdpy/. There is also a presentation on it at the Macadmins conference site http://macadmins.psu.edu/resources-archive/. Thanks David. I actually did come across bsdpy while going through the resources the other author has referenced. Very neat project indeed! have you successfully loaded rebooted and used the esxi datastore internally? I did this same install awhile back, and although it would load. The ESXI would fail after I provisioned the internal SSD. Let me know how you got past that? Also I forgot to mention I think it might be the storage driver somehow.